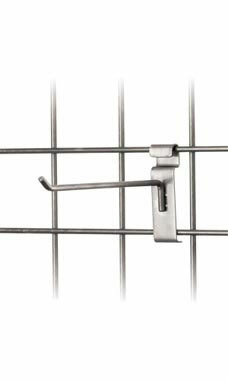 Easily display your merchandise on these Peg Hooks for Wired Grid and Gridwall units! Measuring at 8”, this hook is best for neatly hanging socks and other hanging accessories. Also, you can easily place two peg hooks close together for a simple head band display, which is innovative and will look great! Coming in a sleek steel finish, this piece will look flawless and will fit well with the rest of our raw steel collection! In stock and available for same day shipping. We use 6" and 8" pegs and both look great and are well made. Good quality! I'm using these steel peg hooks on my jewelry rack, (4-sided grid, 2 tier, rotating rack). They work great for the necklace cards, (which I use for necklaces and bracelets). I also bought some shorter hooks for ease of the customer to select an item closer to the rack.